Len Corcoran was making about $35 a week operating a bulldozer for an excavating company located just north of Kingston. At night, he made that much and more driving a race car on the local circuit. With the money he made racing cars, Len was able to break free from his employer, buy his own bulldozer and begin a venture that has grown, changed and prospered for more than five and a half decades. Starting doing simple projects for area homeowners and farmers, by the 1970s and into the early 1980s, LCE was working on large scale residential and commercial developments. By the time Len transitioned out of the business in the late 1980s, the firm had moved almost exclusively into the municipal world, while maintaining a significant presence in the large-scale landscaping market. 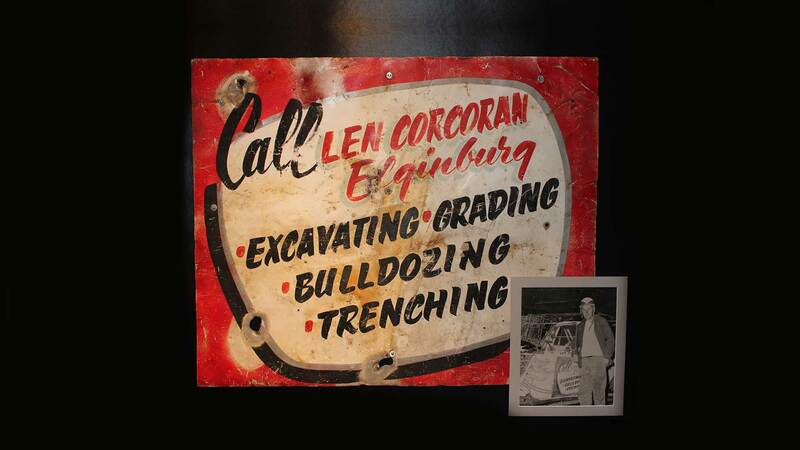 From those humble, but ambitious beginnings, Len Corcoran Excavating has grown under the stewardship of Len’s son Dan from less than two dozen employees in the 1980s to more than 100, and is now the first choice for many area municipalities needing to replace critical underground infrastructure. Like many families in the Kingston community, the Corcorans first came into contact with the UKHF through a significant personal crisis. When company founder Len Corcoran was diagnosed with Non-Hodgkin’s Lymphoma in 1991, son Dan and some friends began a two decades long initiative called the One Lap for Cancer Research, which saw them participate in the world renowned One Lap of America Car Rally. They took pledges each year, with the money being donated to cancer care programs in Kingston through the UKHF. Over 20 years of participation in the event, LCE donated approximately $500,000. As well, Len Corcoran Excavating corporately committed $100,000 to the UKHF Together We Care capital redevelopment campaign. “For me, there are two components that are really key and why we are grateful to have the hospital facilities that we do here in Kingston. First, is that KGH is a teaching hospital which is wonderful for us because it means we have cutting edge research and treatments. Second, Kingston is a hub for cancer treatment throughout the region, so it’s important to ensure we have the programs and facilities it needs to keep up with the demand,” said Dan Corcoran. For more information on the University Hospitals Kingston Foundation, visit https://uhkf.ca. Again, it was through a personal connection that the Corcoran family and LCE began to support the vital and significant work being done by Hospice Kingston. Len Corcoran passed away in 1999, and for the previous year, received dedicated, compassionate care from Hospice Kingston staff and services. “There was a nurse named Sylvie Carpentier and she was one of the most incredible people. She was an excellent nurse, but an even better human being. She helped our dad get his head in the right spot so as he was passing he was at peace and didn’t put an undue sad burden on us,” said Dan Corcoran. So since 1999, LCE has donated regularly to Hospice Kingston, including to the organization’s current capital campaign to help construct a residential hospice facility. The Corcorans also participated in the fundraising efforts on the Walk in City Park commemorative space, which features a fountain and special memorial stones. “One of my dad’s favourite sayings was it has to have mattered that you were there and that was his comment about life in general. And there is a stone there in memory of my dad and it says ‘It Has to Have Mattered That You Were There,’ and it mattered that he was,” said Dan. For more information on Hospice Kingston, visit http://hospicekingston.ca. A number of years ago, through a family connection, LCE was made aware that there were deficiencies in programming for students with special challenges and that funding was one of the main issues. So LCE began to sponsor the Sandra Davison Golf Tournament, which has raised tens of thousands of dollars for the Limestone Learning Foundation. Dan Corcoran, his wife and kids all went to Sydenham High School and they understand the importance of educated, skilled high school students coming into the local workforce, particularly in the skilled trades, so LCE has continued to support the LLF as it creates programs and services for students who may not be academically inclined, but would be perfect candidates for training in the skilled trades. “Not every kid has the ability or even the interest, in becoming a doctor, lawyer or accountant. Over more than 50 years in business, we know how important it is to have young people coming into the skilled trades, which is why we continue to support those students and the Limestone Learning Foundation,” Corcoran said. For more information about the Limestone Learning Foundation, visit http://llf.limestone.on.ca. A group of community leaders came together more than 20 years ago to create a hockey tournament that would raise funds to help economically disadvantaged children participate in organized sports by purchasing equipment for them. The Kids 4 Kids Hockey Tournament has grown from 25 to 30 teams to now more than 140 teams, coming from throughout Ontario and beyond, raising between $25,000 and $30,000 annually for the Kingston Boys and Girls Club, which helps administer the Kids 4 Kids program locally. “Kingston has a proud sporting heritage and we think it’s important for all kids, regardless of their background, to participate in sports. So sponsoring the Kids 4 Kids tournament has been an easy thing for us to participate in, and we have happily done so for more than 15 years,” said Dan Corcoran. On a personal level, Dan Corcoran believed in the importance of enhancing Kingston’s downtown core to make it a place where both local residents and visitors could feel welcome and have a space that promoted local arts, culture and business endeavours. Which is why he and LCE became firm proponents of what would become Springer Market Square, a centerpiece of year-round festivities, featuring the skating rink, and space to accommodate concerts and other fun, family-oriented events. “It was something that people had talked about for 20 years before a few key people decided to finally move it forward, and we were asked if we would participate and help sell the project and show that there was genuine interest in helping it move forward,” said Dan. Len Corcoran Excavation has supported various charities and causes for the last 20 years. Notable initiatives include sponsoring a team in the Limestone Classic Hockey event (2010 Feb Fest at Springer Market Square), competing in the One Lap for Cancer Research and the Cannonball One Lap of America motor-sports events raising in excess of $500,000 for cancer research, and participating in live & silent auctions to support B’nai Brith and other charities. LCE continues to support the Kingston Partners for a Safe Community Safety Group, promoting safe jobsites, information jobsites, information exchange and peer tutoring with the goal of making Kingston a safer place to live work and play.